In 2011 Eric Reis changed the way entrepreneurs think about startups. From his breakout book, The Lean Startup (Crown Business, 2011), the idea of the minimum viable product (MVP) became a common concept for emerging companies. If you’ve read the book, you will recall that the framework of minimum viable product requires three elements. First, the initial offering must have enough value for users to try out the product or service initially. Otherwise, it is a short, unpleasant journey back to the starting line. Second, this MVP, while limited in its initial instantiation, must have the promise of future capabilities to keep early adopters engaged. Finally, there has to be a way for these early adopters to provide feedback direct future development of new products and new features. Many companies and entrepreneurs have embraced this approach when crafting their initial product plan and as an investment firm specializing in the growth stage, we see many organizations that have successfully launched an initial, minimally viable product and are on the path for expansion and profitability. There are many items on the marketing to-do list for startups. Many of them require staff and budget and are often postponed until after initial product launch and first customer ship and the financing that follows. However, a trend that we see is that startups focused intently on MVP miss the opportunity to engage in low-cost marketing initiatives that can dramatically improve the odds of a successful product launch and accelerate the subsequent transition to the growth stage. We call these three activities the suite of Minimally Viable Marketing (MVM) tools. In short, it is “tell”, “sell”, and “compel”. identifying and reaching these users with a relevant value proposition. keeping early adopters and expand demand generation to later stages of users. driving customer engagement to ship metrics like customer satisfaction (CSAT) metrics and expand customer lifetime value (LTV). Though they are inexpensive to implement, they do require a significant commitment on the part of the leadership team. Time in conference rooms debating ideas may seem like a loss of productive time but by honing these three elements, the organization is essentially planting the seeds for future success and faster growth. It’s the same in when it comes to messaging and value proposition. There are very systematic ways you can develop a coherent mission statement and company vision statement. Messaging and value proposition refinement is the first among equals in the MVM process. Creating demand generation processes and content strategy without a clear idea of who the customers are and why they need to care about you is obviously a recipe for failure. why should the customer care? In many startups, the emphasis is on features. Our product can do this. Our service is this. We have this much capability. These are all features they appealed to the logical part of the brain. And they’re absolutely essential when completing the purchase process. However, before we get to that level of logical decision-making we need to connect with customers and an emotional level. Can you make a sale and keep a customer happy based only on feature comparisons? Of course. However, like the other elements of minimum viable marketing, expanding the messaging to emphasize benefits makes a customer appreciate your product or services more deeply which can translate into greater loyalty, satisfaction, and long term value. Also, if you are pursuing an “MVP” strategy, you want to develop and enrich the relationship to your early adopters. Diving deeper into the messaging framework will create a greater connection. The second major area where startups often don’t concentrate enough attention is in demand generation. The morning after the launch party is not when the work begins. The key here is to pick a model and use it. By now everyone it should be familiar with the concept of a demand funnel, codified by a company called Sirius Decisions. Their original model looks like an inverted wedding cake. At the top is a broad pool of potential customers from all of your marketing activities like trade shows, email campaigns, visits to your website, PR activities etc. From there, you reduce the total number of inquiries by using the set of criteria to drop into the next layer: marketing qualified leads (MQL). The process is repeated with additional filters to get a pool of sales accepted leads (SAL), and then to sales qualified leads (SQL). From there, there are only three possible outcomes: the deal is closed-won or closed-lost or recycled. On the subject of recycling, the diagram over simplifies the process where leads that are not ready to proceed to the next stage are placed in recycling or nurture programs. While it’s represented as a single block for the sake of simplicity, in reality, each stage, each market segment, individual geographies or industries can all have programs tailored to them. It’s a lot of work to do that and requires a rich library of content and if you want to learn more about lead recycling/nurturing and remarketing and retargeting. Here are a couple of caveats and a couple of tips. Tip: Implementing a lead scoring system where demographic data and behaviors trigger admission into the next layer of the funnel can save a lot of time and finger-pointing. Caveat: There are many different ideas and permutations on this funnel. This is the simplest one. There are others you can see here. Tip: Better to implement a simple demand funnel well then fail to launch a comprehensive one. Tip: Get a customer relationship management system (CRM). Tip: Use your CRM religiously. Caveat: do not wait for perfection before you implement this funnel process. Your first attempts will be off. The lead scoring will be wrong. There is a ton of information on lead attribution and marketing ROI. Stay on target and get the system up. You can fix it later. On the subject of targets, people often ask what are good conversion rates? Here are some figures to consider in demand generation on average according to a research project by serious conversions per 1,000 raw leads for average and best in class companies. So if you started with 1,000 raw leads, only 4.4% or 44 actual leads would pan out as marketing qualified on average if you are average. If you are best in class, that number is slightly higher at 93 of 1,000. The rest of the funnel is less grim but closed deals are still 3 per 1,000 on average and 14 per 1,000 for best in class. Clearly, a simple process to track the number of raw leads, the number of qualified, and the number closed deals and the average deal size will form the basis of a forecast. What’s more, monitoring the individual metrics in the process can provide powerful insights. A high reject rate between marketing qualified leads and sales accepted leads thinks might indicate a problem with criteria marketing is using to score or progress leads. On the other hand, if every marketing qualified leads converts to a sales accepted lead maybe the marketing criteria are too stringent. There should be some breakage; just no too much and not too little. You have a benchmark, but you need to be ready to measure for yourself and track changes over time. Also, consider how long a prospective customer stays in each stage of the funnel. Reducing the time it takes for a lead to get through increases the number of possible engagements with the same number of sales people. Just remember that you don’t need to have first shipping product to think about this. Have a framework in place so that when the product is ready to go you’re also ready to go with a system to track and evaluate the effectiveness of your marketing programs. The final part of the minimum viable marketing process is you plan for content. If your organization has bought into a minimum viable product philosophy, you’re committed to follow-ons and to the initial product. To do this means forging an ongoing relationship with the customers. The time to think about this is before the first product ever ships and one of the most effective ways to reach out to existing customers and cultivate new ones is through content. 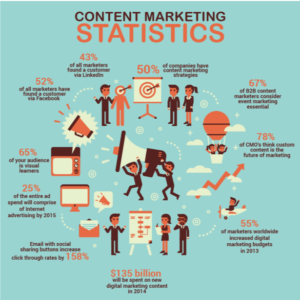 According to visual.ly, in 2014 $135 billion dollars were spent on digital marketing content. Of the CMOs surveyed, 78% think that custom content is the future of marketing. How do you do it in a resource-constrained start-up? Again, this is an area where the talent and the knowledge of the team inside can provide an effective alternative to expensive programs – at least to start. First, generate the news and information. Write articles. Interview thought leaders or influential customers. Seek out press and speaking opportunities. Provide best practices guides. Basically, demonstrate what your team and organization should already know about the space you’ve chosen to invade. Accumulate your content so you’re not living “pen to mouth”. You may find that some of your teammates are better at this than others. Some will also be more willing than others to contribute. It’s great when they are the same people. Set up overarching themes for the content. Make sure the content is consistent in appearance and tone and that it is highly reflective of the mission and values of the company that you established the first part of your minimum viable marketing. Finally, be generous. Create a reciprocity obligation by giving with no expectation (other than an email address). Provide access to the value inside your organization. There are many resources to help you in this process but the key here is to be consistent, plentiful, and relentless to create content that will reinforce your brand create engagement and drive loyalty. The three areas outlined in a minimum viable marketing approach share two key characteristics, First, they can be done with modest, internal resources. It is not a plan that requires deep spending necessarily. That can and should come later. It is driven by the wisdom and intelligence of the existing team, It does require time and effort and should not be undertaken lightly or with the belief that this will be the work of a couple of hours. The second common characteristic is that all three of the elements should be undertaken BEFORE entering the growth stage. They should be ready to go at first product shipment. With respect to messaging and value proposition you need to get one, you need to make it ubiquitous, and you need to make it. For demand generation remember you need a model to follow and even a plain model is better than no model. It’s impossible to improve what you cannot track. Finally, in content creation, the core idea is to grind out the gifts. If you keep at it, customers both current and prospective will think about you and thank you with their business. Mercato regularly produces content dedicated to helping entrepreneurs to effectively and efficiently grow their organization. Browse and sign up to get the latest content. Tell us why you’d like to connect and we’ll reach out to you as soon as possible.